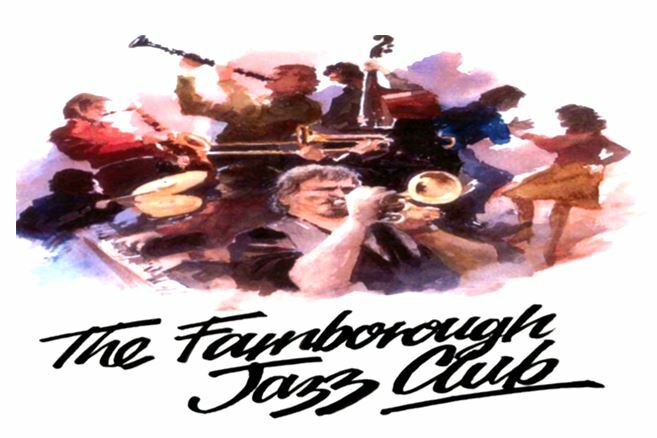 Phoenix Dixieland Jazz Band at Farnborough Jazz Club on 22nd January 2015. 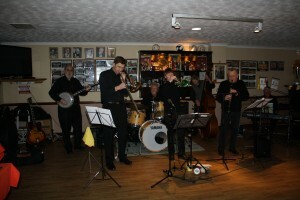 Leader Robin Coombs (clarinette), Paul Higgs (trumpet), Bill Todd (tromb), Dave Barnes (piano), Roger Curphey (d.bass), John Stewart (banj&guitar) and Alan Clarke (drms). Photo by Mike Witt. PHOENIX DIXIELAND JAZZ BAND was the order of the day here at the Farnborough Jazz Club on 23rd January 2015. 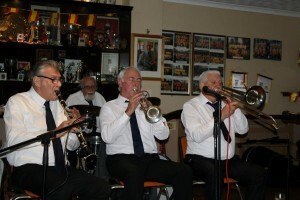 Leader and clarinettist ROBIN COOMBS had booked PAUL HIGGS to be on trumpet, BILL TODD on trombone, DAVE BARNES on piano, ROGER CURPHEY on double bass, JOHN STUART on guitar (WHO’S HE? huh) and ALAN CLARKE on drums. Dave Barnes (piano) looking pensive. 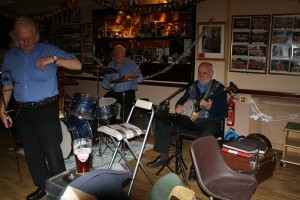 Seen here with Roger Curphey (d.bass) and Alan Clarke (drums). 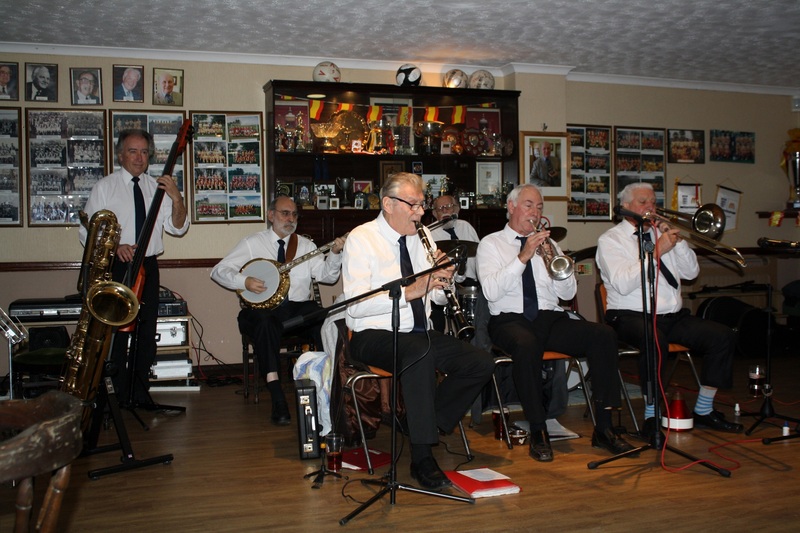 Phoenix Dixieland Jazz Band at Farnborough Jazz Club (Kent) 22jan2015. Photo by Mike Witt. There is quite a story attached to the next number. A while ago, Dave met up with an old friend, Ian Grant, lyricist of ‘Let There Be Love’ (1940). He showed Dave some lyrics he’d written fifty years ago called ‘We’re Handing it to You Mr Handy, for handing us the St. Louis Blues’, referring to W.C. Handy, composer of St. Louis Blues. He asked Dave if he could put some music to it. The end result is they played it for us and how I wished I had recorded it. It had a lovely beat and certainly packed the dance floor. ‘When I married Sweet Loraine’ was sung by Paul, then he was featured in the next number, ‘Sometimes I wonder Why I Spend the Lonely Nights’. Wowie Paul, you are brilliant. 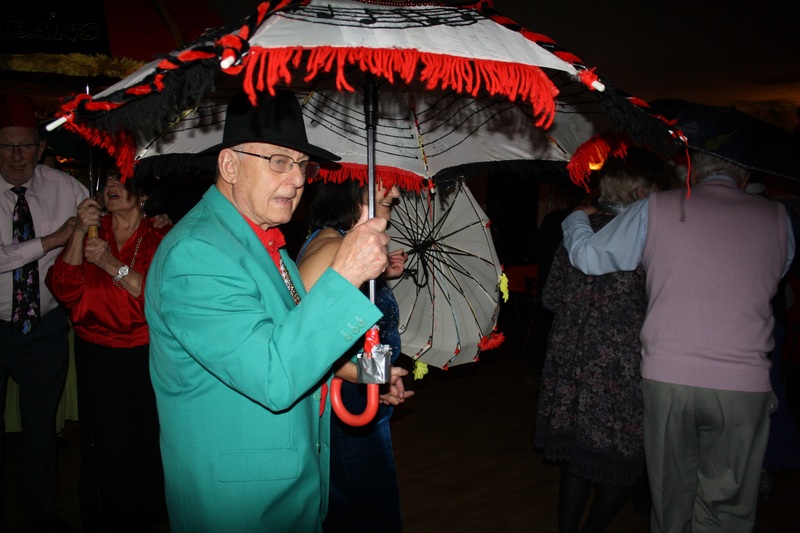 Now the next number is a great old favourite, made more famous by Glen Miller, namely ‘Little Brown Jug’ and several of us got up to do our (fun Charleston style) line-dance. What can I say about ‘Pennies From Heaven’? Only that I was busy dancing! 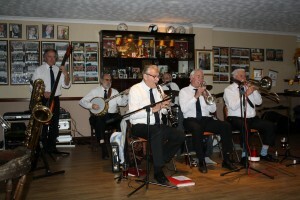 I must mention ‘At the Jazz Band Ball’, of course a great Kenny Ball trad favourite. 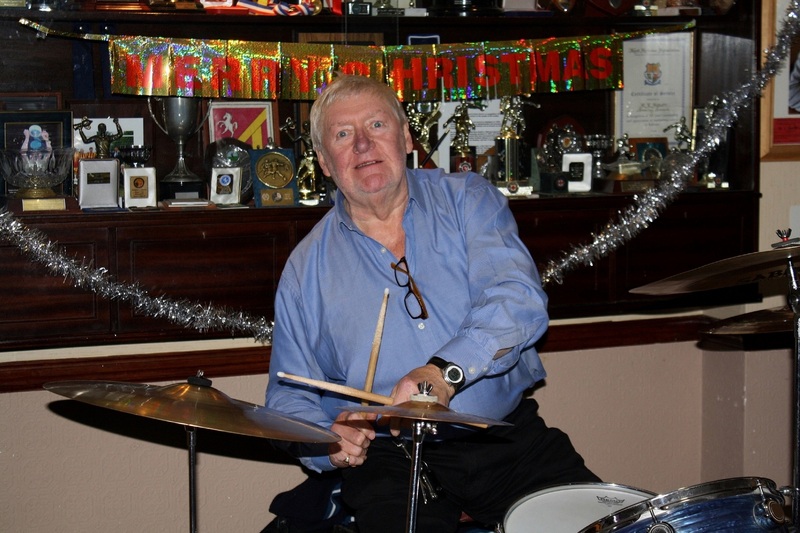 They certainly did it justice too – fabulous drumming from Alan. 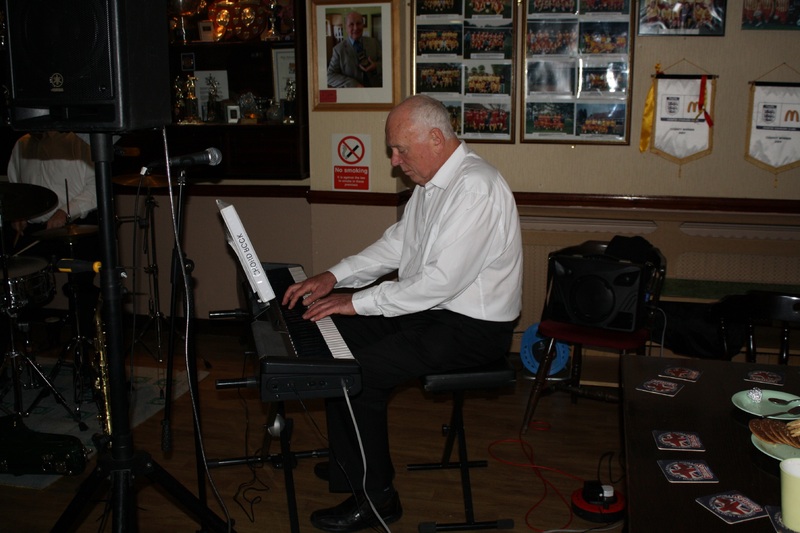 Of course the next number, sung by Bill, was played for our Len (for obvious reasons), ‘Please Don’t Talk About Us – One Eyes Gone’. Ol’ Lennie has a great sense of humour. 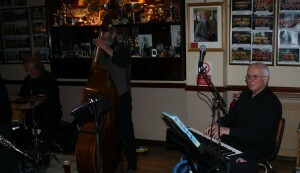 John Stewart takes a solo, whilst Bill Todd (tromb) looks on. 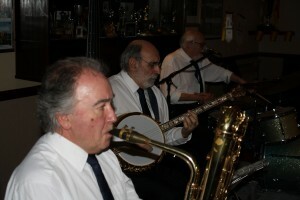 Phoenix Dixieland Jazz Band on 23Jan2015 at Farnborough Jazz Club (Kent). Photo by Mike Witt. My last to mention is ‘Sweet Georgia Brown’. It was sung by Dave, plus must mention a great solo by John on banjo. 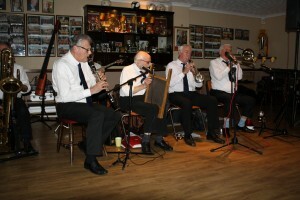 Well another super evening from this band and so you must make a note they are back on 5th June 2015. 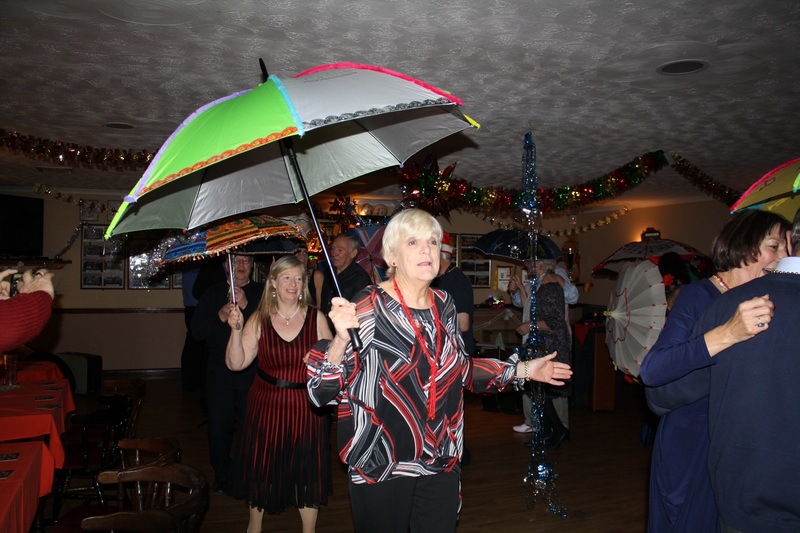 Don’t forget our new times are 8:00pm till 11.00pm – plenty of fun people to meet and you can enjoy some dancing (even if you are bad at dancing, we don’t mind) and probably some audience participation singing too – knowing our fun audience. 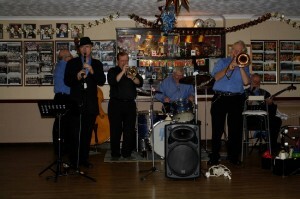 This entry was posted in Phoenix Dixieland Jazz Band on January 26, 2015 by Diane. The LORD NAPIER HOT SHOTS produced a really happy atmosphere for us on Friday 16th January 2015, here at FARNBOROUGH JAZZ CLUB. The musicians in the band were MIKE JACKSON on trumpet, MIKE DUCKWORTH on trombone, PAT GLOVER on reeds, JOHN STUART on banjo, MICK SCRIVEN on double bass & bass sax and ARTHUR FRYATT on drums. They had been playing lunch time at the Lord Hood in Greenwich, but you would not have believed it as they were all so fresh. 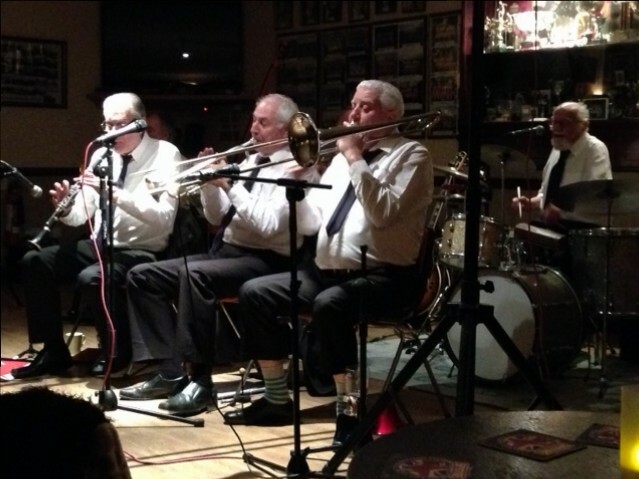 NAPIER HOTSHOTS with (ltoR) PAT GLOVER (reeds), MIKE JACKSON (trmpt), MIKE DUCKWORTH (trmb), plus ARTHUR FRYATT (drms) at Farnborough Jazz Club, 16th January 2015. Photo by Selina McKinven. NAPIER HOTSHOTS at Farnborough Jazz Club, 16th January 2015. MIKE JACKSON (trmpt), MIKE DUCKWORTH (trmb), PAT GLOVER (reeds), JOHN STUART (bnj), MICK SCRIVEN (d.bass&bass sax) and ARTHUR FRYATT (drms). Photo by Mike Witt. 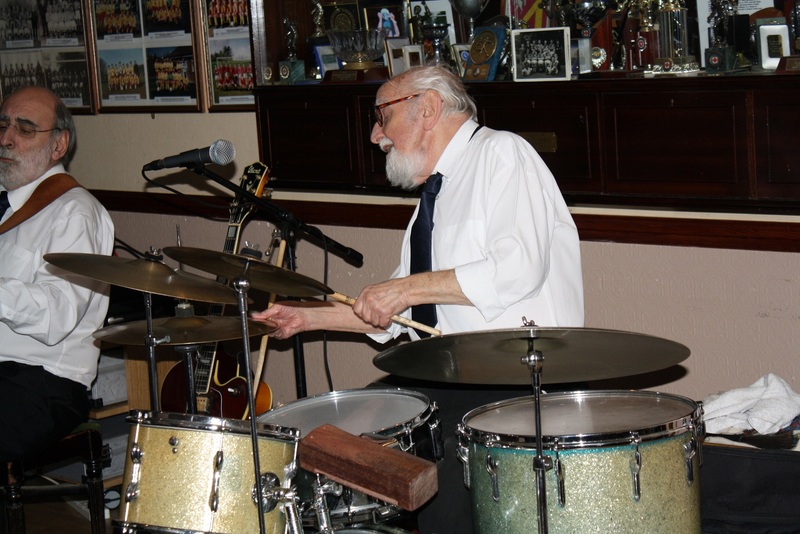 ARTHUR FRYATT, drummer with NAPIER HOTSHOTS seen here at Farnborough Jazz Club 16th January 2015. Photo by Mike Witt. Dear Arthur is now 86 years young, so definitely a ‘one up yours’ to all the government, medical and media bods who are talking about our ‘aged’ generation being a waste of space. Our audience can vouch for this being laughable. A young couple in their 20’s (I think), in our audience had this band for their wedding. Plus, my granddaughter (who is two weeks off her ninth birthday) enjoyed herself too at my birthday celebration evening (the last one for this year-ha). 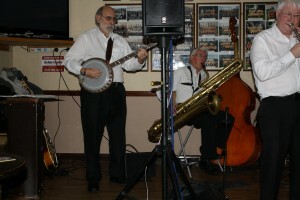 Thanks boys for entertaining me/us with a super assortment of good jazz. Now the difficult job of what to mention and what not to mention, so not to give their complete repertoire away! To begin with, their first number was ‘That Da Da Strain’, a ‘Bob Crosby and his Bobcats’ famed number’ and a fabulous one to start off with. 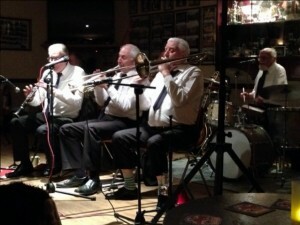 Front line MIKE JACKSON (trmpt), MIKE DUCKWORTH (trmb), PAT GLOVER (reeds) (plus ARTHUR FRYATT (drms) of NAPIER HOTSHOTS at Farnborough Jazz Club, 16th January 2015. Photo by Mike Witt. 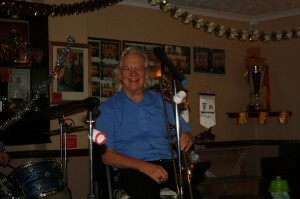 Pat, who has a very pleasant engaging voice, sang the next number, ‘In the Shade of the Old Apple Tree’. Arthur also has a wonderful jazzy voice and sang ‘Just a Little While to Stay Here’ for us. Then a really lovely number I don’t think has been played here before was ‘All Alone by the Telephone’ (both John McCormick and Al Jolson had number 1 hits with this one). Then ‘One Sweet Letter from You’ was another great number and must mention that Arthur gave a marvelous drum solo, although they all performed fabulous solos. Mike (J) then sang ‘Weary Blues’, Mike also has a great voice (phew so many great singers around). Arthur Fryatt on washboard joins front line of Napier Hotshots at Farnborough Jazz Club on 16Jan2015. Photo by Mike Witt. Next, Arthur came up to join the front line and we had a couple of brilliant songs with him performing on washboard (& vocals), one number being ‘Doctor Jazz’. 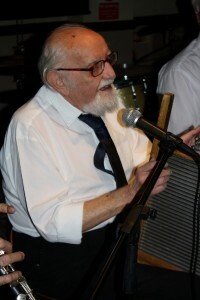 Arthur Fryatt, 86yrs young (drummer) playing washboard for Napier Hotshots at Farnborough Jazz Club on 16 January 2015. Photo by Mike Witt. MICK SCRIVEN playing big bertha (bass sax) for NAPIER HOTSHOTS at Farnborough Jazz Club on Friday 16th January 2015. Photo by Mike Witt. I put couple of asterisks next to the next one, ‘New Orleans Shuffle’. Certainly a fun number, played brilliantly. My next number to note was ‘Cake Walking Babies’ as it was our choice to perform our line-dance to, it has a great tempo – always a little bit of fun. Only five of us this time, as some regulars were away with illness. Then for their closing number, they played that aptly named finale ‘Get out of Here and Go on Home’. 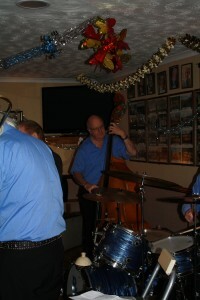 The engine: MICK SCRIVEN (bass sax), JOHN STUART (bnj), and ARTHUR FRYATT (drms) of NAPIER HOTSHOTS at Farnborough Jazz Club, 16Jan2015. Photo by Mike Witt. Definitely a return date has to be sorted for later on in the year. We have the Phoenix Dixieland Jazz Band next week, Friday 23rd January 2015. So see you then and here’s reminding you of our new times, 8.00pm till 11.00pm. 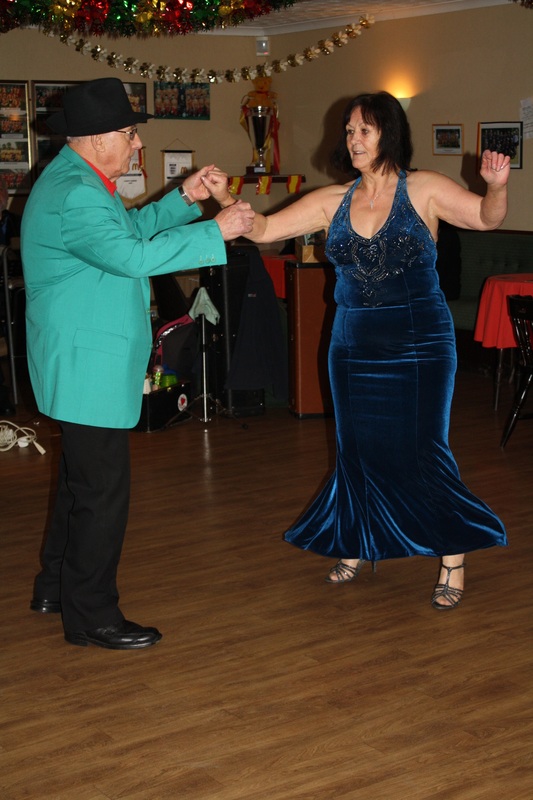 This entry was posted in Lord Napier Hot Shots on January 20, 2015 by Diane. 2015 already! I can’t believe it. 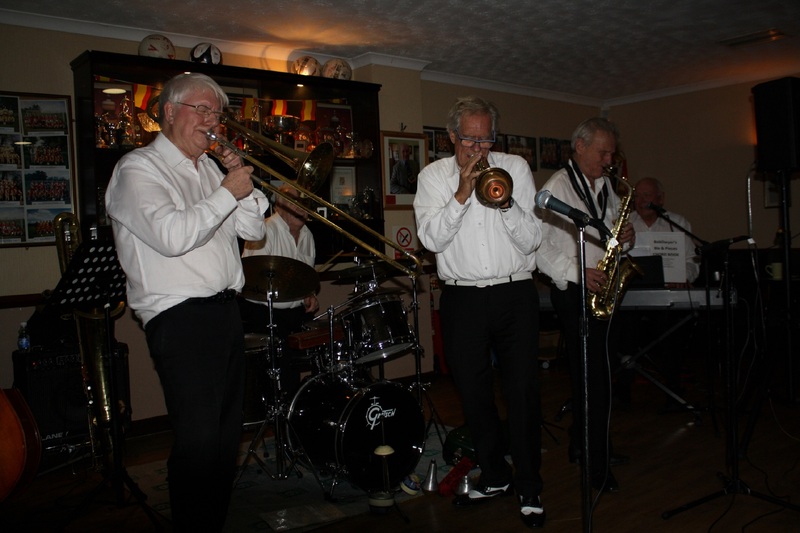 Anyway, BOB DWYER’S BIX & PIECES entertained us for our first gig of the year, on Friday, 9th January 2015 here at the Farnborough Jazz Club, Kent. I remember Bromley (Kent) man H.G. Wells’ book and the film ‘1984’, which all seemed so futuristic and now we are still enjoying wonderful songs from the 1915/30’s era. Oh no, they are not old fashioned, the tunes are still used for adverts on TV today! Now let me tell you of the happy little evening we once again had. 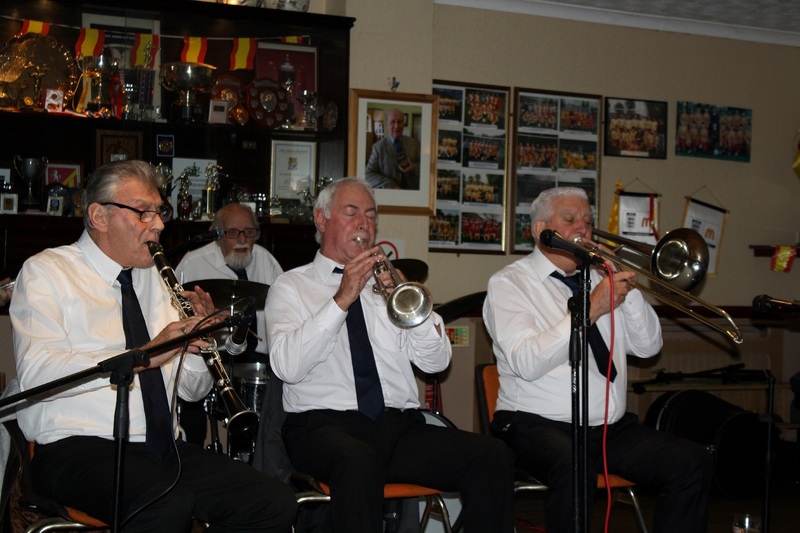 Leader BOB (trombone & vocals) had booked DAVE RANCE on trumpet, cornet & flugelhorn. I said last week that we thought it was his first time here, and so wished him a warm welcome to our club. I actually said to Keith I thought I recognised his name. 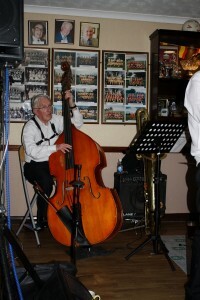 Well, when Dave walked in, I did recognise him, because he has played for us before with the Yerba Buena Jazz Band. 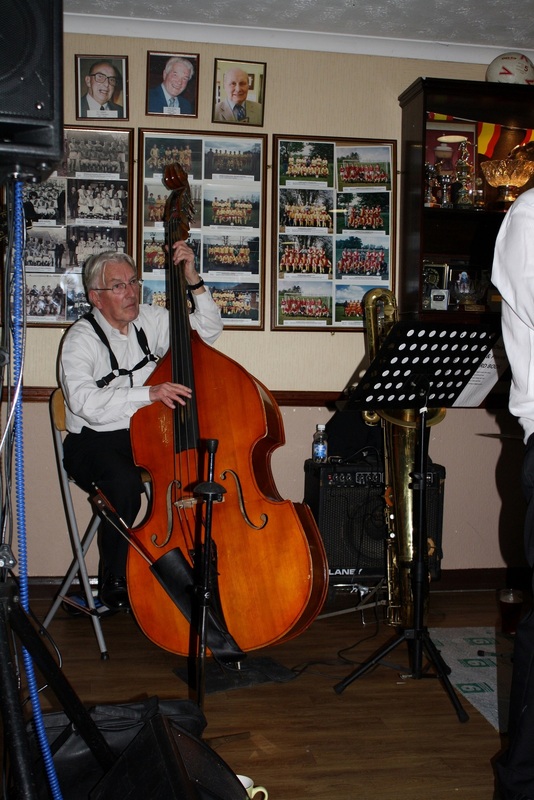 Dave certainly fitted in with the rest of the gang, who were BERNIE HOLDEN on clarinet & sax, HUGH CROZIER on piano & vocals, JOHN BAYNE on double bass & bass sax, JOHN STUART on banjo & vocals and LAURIE CHESCOE on drums. 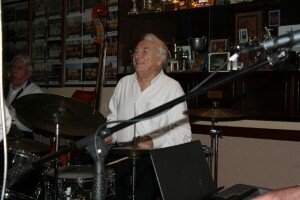 Bob Dwyer’s Bix & Pieces at Farnborough Jazz Club on 9th January 2015. 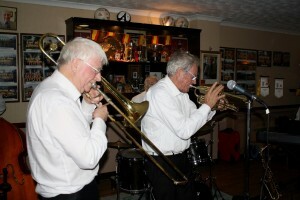 Bob on trombone and dep Dave Rance on trumpet. Photo by Mike Witt. The evening was to be the first of my mid-week birthday celebrations. I shall finish celebrating next Friday, because I’m greedy that way – ha. ‘Moose March’, what an excellent number to kick start the evening (well for me – I missed the first one due to people pouring through the door). Anyway, Dave was super on trumpet. Then Bernie had a great solo, plus Bob did a lovely job with singing ‘Baby, Won’t You Please Come Home’. Likewise Bob did so with ‘No Regrets’. I wonder Bob, did you choose this number, an Édith Piaf number as she was born in 1915. But for whatever reason, nice one Bob. Then I just have to mention Irving Berlin’s ‘Puttin on the Ritz’, one that they play often for us and of course we appeared on the dance floor for our (Charleston-style) line-dance with seven or eight of us. You better come and join us with this before we start progressing to a higher level or even go professional– ha. Hugh Crozier, pianist with Bob Dwyer’s Bix & Pieces at Farnborough Jazz Club on 9th January 2015. Photo by Mike Witt. 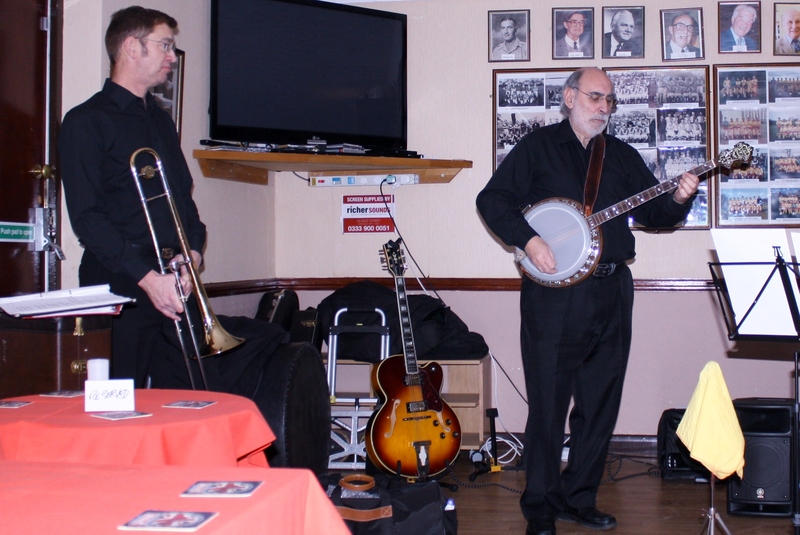 John Staart, banjo&guitar and John Bayne, d.bass & bass sax, with Bob Dwyer’s Bix Pieces at Farnborough Jazz Club on 9th January 2015. Photo by Mike Witt. I filmed the band playing it, but it is too dark (I will try to sort), however, I must say it is certainly wonderful to hear – Hugh is brilliant, not only with his piano playing, but singing too, John Bayne comes over terrific with his bass sax – oh by the by, I’m always praising Bob’s singing, but he is pretty fabulous on trombone too. To continue, Dave showed us how well he sings and Bob joined in with a little harmonising to ‘I Can’t Give You Anything But Love’ wonderful job fellas. Then ‘Kansas City Kitty’ was a pretty rousing up-tempo number for dancing, sung by Bob and played brilliantly by everyone. It’s one of those numbers you know how it goes when they start playing, but cannot remember what it is called – enjoyable though. This was followed on by Hugh singing ‘Good Morning Blues’, another number that you know when it is sung. Well done Hugh. 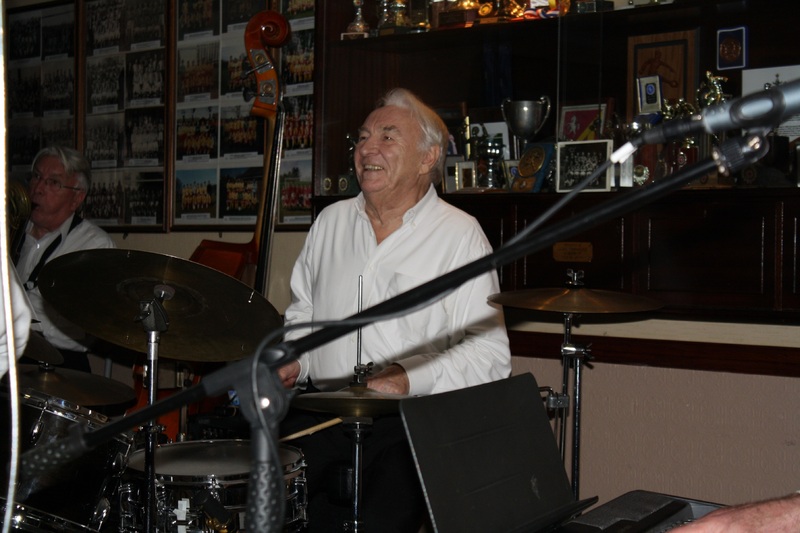 Laurie Chescoe, drummer with Bob Dwyer’s Bix & Pieces at Farnborough Jazz Club on 9th January 2015. Photo by Mike Witt. After a break, they came on and played ‘Lilly of the Valley’, which was sung wonderfully by Dave, plus I must mention Laurie, who performed a marvellous drum solo. Keith said not many people would realise it is more difficult to perform a solo to a slow number, than to a fast one. It was Hugh’s turn to sing the next number, being ‘You’re Driving Me Crazy’ and what a performance. 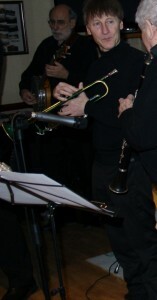 John Stuart (banjo & guitar) depping with Bob Dwyer’s Bix & Pieces at Farnborough Jazz Club on 9th January 2015. Photo by Mike Witt. 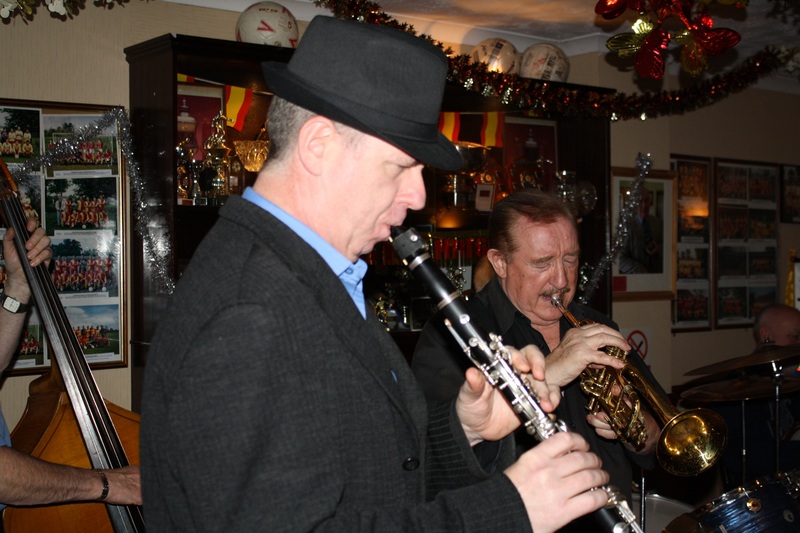 John Bayne, d.bass&b.sax with Bob Dwyer’s Bix & Pieces at Farnborough Jazz Club on 9th January 2015. Photo by Mike Witt. I must mention (or have I said it before – ha) just how brilliant John Bayne is on ‘Big Bertha’. 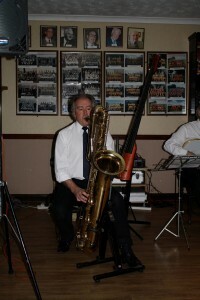 He played it (bass sax I mean) during ‘Singing the Blues’, which brought on plenty of dancers. Bob always makes Keith and I feel good by playing and singing our song ‘Nice to Know You Care’ and as it was my pre-birthday celebration, he/they didn’t disappoint us, so thanks. 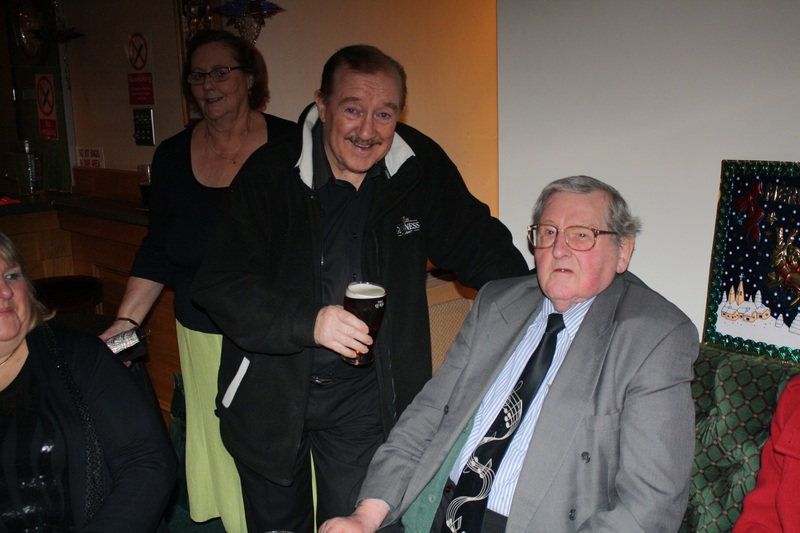 Now you know what a lovely evening we all have – plenty of NICE hours, how about joining us next Friday, 16th January 2015. We have ‘Lord Napier Hotshots’ for my last birthday celebration evening. Hey, don’t forget our new times, it all kicks off at 8.00pm (ending at 11.00pm). Always enjoy ‘live’ music, preferably with us. ‘Lily of the Valley’ – hymn written by William Charles Fry (1837–1882) in London for the Salvation Army. This entry was posted in Bob Dwyer's Bix & Pieces on January 14, 2015 by Diane. Our next date is 9th January 2015 with Bob Dwyer’s Bix & Pieces (seven piece). This entry was posted in Uncategorized on January 2, 2015 by Diane. GEORGE TIDIMAN AND HIS STARS made sure we all had a wonderfully ‘cracking’ fun-filled Christmas Party on 19th December 2014 here at our Farnborough Jazz Club. Their music was extra special and of course George’s inimitable self, kept the jokes fully flowing. This is not an act, he is a naturally funny man and we just love him. Of course his stars are really true stars too, with DENNY ILETT on trumpet, TIM HUSKISSON on clarinet, ‘SOUTHEND BOB’ ALLBUT on banjo, JOHN SIRETT on double bass and BILL FINCH on drums. A fabulous photo of trombonist and band leader, George Tidiman at Farnborough Jazz Club’s Christmas Cracker Party (with his All Stars) 19th December2014. Photo by Mike Witt. Tim Huskisson (clarinet) and Denny Ilett (trumpet), two of George Tidiman’s All Stars at Farnborough Jazz on 19th December 2014 Club Party Night at Farnborough. Photo by Mike Witt. 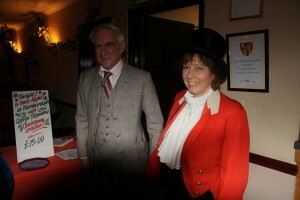 Our friends fully supported the party and must mention some wonderful party outfits – as you will see by some photos taken. The evening’s fun started with ‘You Always Hurt the One You Love’ (the band’s theme tune), with the dancers out at the start, showing everyone was ready for partying. George sang (and played of course) ‘Magnolias Wedding Day’ – lovely jubbly. Now the intro to the next number was absolutely magnificent by Denny, oh what a talent. I know, I’ve said that before – but it’s true! The tune was ‘Do You Know What It Means to Miss New Orleans’. Of course they all played it terrifically. Then came Bob’s turn to sing with ‘Ace in the Hole’. I just love his baritone voice and he carried on singing with ‘It Takes a Worried Man’. Oh and I wrote ‘fabulous’ at all solos by each musician. Then if that wasn’t enough, came another brilliant intro from Denny to ‘Stardust’, with them all joining in, each playing beautifully. Our usual line-dance (Charleston style) came next, when Bob sang ‘You’re Bound To Look Like A Monkey When You Grow Old’. Plus George singing ‘My Little Bimbo down on the Bamboo Isle’, with him playing slide whistle (I think that’s its name) etc. Such a lot of fun. George Tidiman with two of his All Stars, Bill Finch (drums) and ‘Southend Bob’ Allbut (banjo) at Farnborough Jazz Club’s Christmas Cracker Party on 19th December 2014. Photo by Mike Witt. 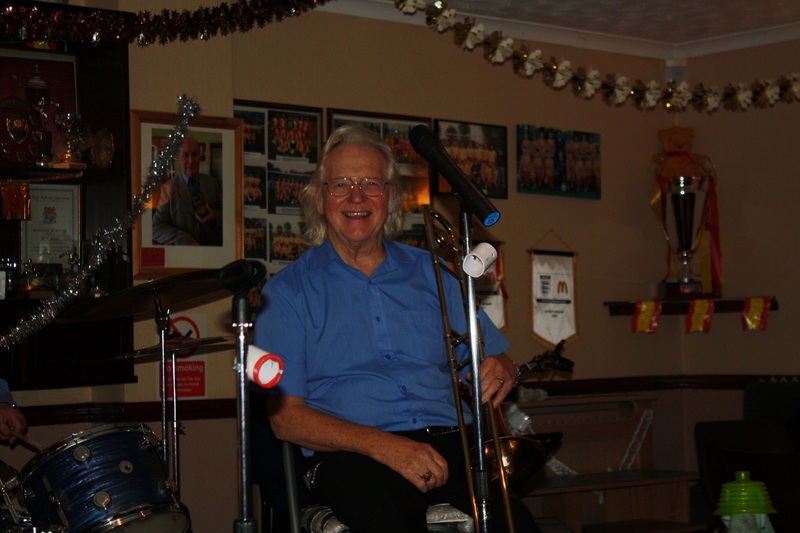 JOHN SIRETT (d.bass), one of George Tidiman’s All Stars at Farnborough Jazz Club’s Christmas Cracker Party, 19th December 2014. Photo by Mike Witt. 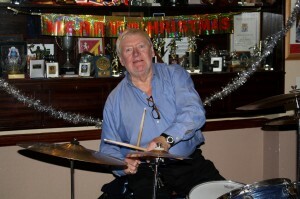 Bill Finch (drums) one of George Tidiman’s All Stars at Farnborough Jazz Club’s Christmas Cracker Party, 19th December 2014. Photo by Mike Witt. ‘Comparing Notes’. Denny Ilett and Colin Dobson exchange old times. 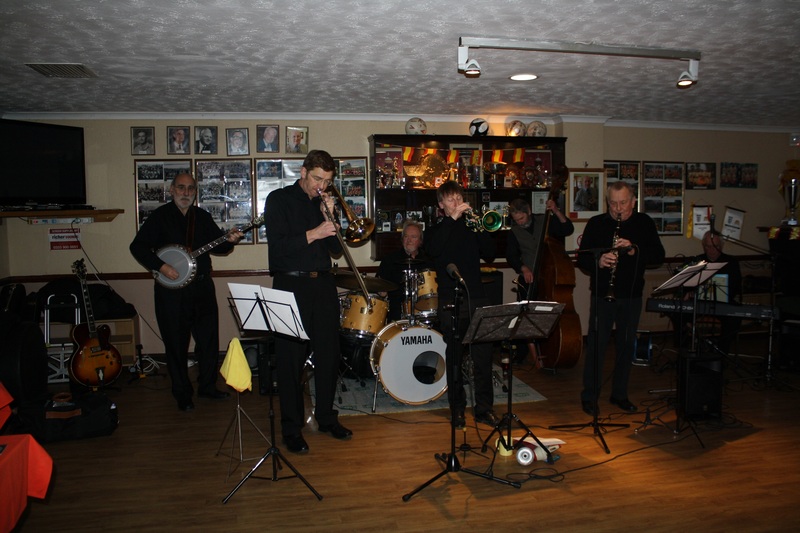 George Tidiman’s All Stars at Farnborough Jazz Club 19Dec2014. Photo by Mike Witt. Steve and me (Diane) dancing [publishing photo to encourage my 2015 diet – I’m so enormous, yuk!]. 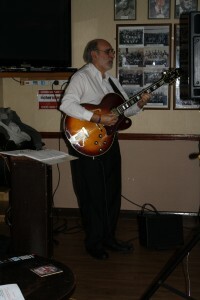 George Tidiman’s All Stars at Farnborough Jazz Club 19Dec2014. Photo by Mike Witt. 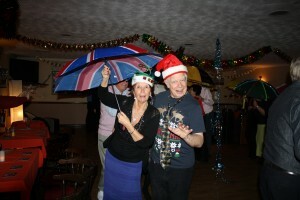 Grace and Martin show wonderful effort to party with George Tidiman’s All Stars at Farnborough Jazz Club’s Cracker Party. 19Dec2014. Photo by Mike Witt. Just in time, Steve brought out the umbrellas for the ‘Bourbon Street Parade’ and our party ended on a complete high with tons of photos being taken and so many smiling faces. Such a wonderful evening of magic. Thanks George, Denny, Tim, Bob, John and Bill, plus (serving our drinks) Ian, Val, Harry, Kath and Barb, with Ameri-Carlo’s food and all our wonderful party-going (or coming) friends for making Keith and I feel it was all worth it. Steve (center) with Bob and June (left) take part in the brolly parade (‘Bourbon Street Parade’). George Tidiman’s All Stars at Farnborough Jazz Club 19Dec2014. Photo by Mike Witt. 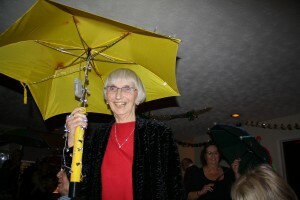 Ann takes part in the brolly parade (‘Bourbon Street Parade’). George Tidiman’s All Stars at Farnborough Jazz Club 19Dec2014. Photo by Mike Witt. 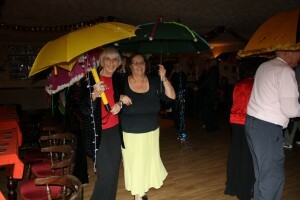 Christine and (left)Mary take part in the brolly parade (‘Bourbon Street Parade’). George Tidiman’s All Stars at Farnborough Jazz Club 19Dec2014. Photo by Mike Witt. Jackie and Paul take part in the brolly parade (‘Bourbon Street Parade’). 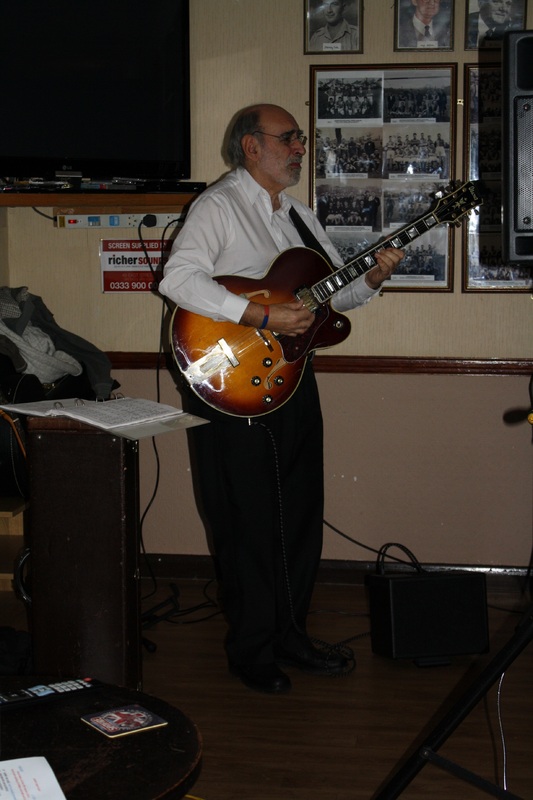 George Tidiman’s All Stars at Farnborough Jazz Club 19Dec2014. Photo by Mike Witt. Ann & Pat take part in the brolly parade (‘Bourbon Street Parade’). 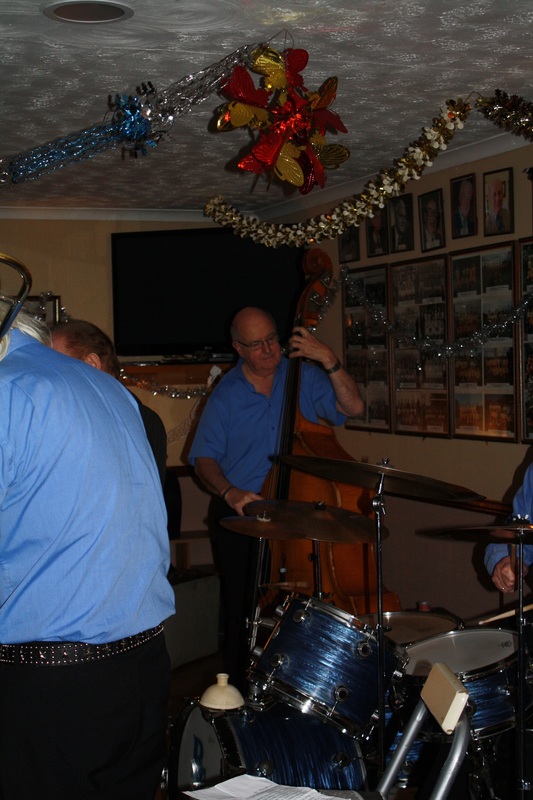 George Tidiman’s All Stars at Farnborough Jazz Club 19Dec2014. Photo by Mike Witt. However, this evening had its flaws, completely down to me. What? I can hear you say. That can’t be so! Well, for many months, I had been experiencing such silly little problems, but lots and lots of them and collectively, they were draining! One problem was our land-line being out of order, giving an ‘engaged’ tone, so people kept trying (needing to book for the party). Then my laptop lid broke (couldn’t open it up and ended in ‘hospital’ (obviously now mended), plus my only other means of contact (and I needed to contact possibly over one hundred people) – my mobile went missing! Oh, it all had its own reward of course. I was back in the 1950’s, when we had no telephones, but then one would write a letter. However, this was Christmas and post in those days would have been delivered quickly and at little cost! Oh those lovely days when we were all sane, aye? But I didn’t personally know all the wonderful musicians who were famous then. So I feel very privileged to know these musicians of today. Now what about one of those other problems I mentioned – Oh you’ll love this one! We decided to try Farnborough’s own delightful (small) café to provide our party food. Ameri-Carlo’s is a wonderful place to visit with home-made food – check it out for yourselves. So what was the problem you ask? To begin with, I asked for ‘plates’ for every table (the food was much more than adequate for one person), but of course I should have asked for ‘platters’. Consequently, there was not enough food – especially as when everyone had left, I found two bags with 16 PLATES LEFT OVER!!!!!!! Plonker you say! No, PRATT – that’s my name! So my message to everyone who came on the day is I shall try to make it up to you somehow. Val (behind the bar) said she will save the sausages-on-a-stick in her chicken shed, till our next gig on 9th, so you can look forward to some compensation. She assures me they will still be tasty (just heard on the TV, Eric Idle’s song from Monty Python’s Spamalot, ‘Always Look on the Bright Side of Life’ and seems apt to mention it here). Anyhow, we do hope you had a super festive season and also wish you a Happy New Year and are certainly looking forward, with your support, to keeping the club open for yet another year. Thanks Mike for taking the many photos of everyone having fun and I do hope no-one objected to my including them (if you do, please let me know and I will remove it). Oh happy days, keeping jazz ‘live’. This entry was posted in George 'Kid' Tidiman's All Stars on January 1, 2015 by Diane.